Last week I posted about my new favorite grain-free almond banana waffles. They are really different than my original grain-free waffles, since they are not as dense and taste super great plain. One of my most favorite things to do with leftover waffles is make grain-free waffle sandwiches! I don't eat any gluten-free bread and so this has been a great option for me when I really want a sandwich, which happens occasionally but not very often. The combinations are endless. My pictures here show organic turkey bologna with real sharp cheddar cheese, dijon mustard, homemade mayo and fresh green lettuce. Best of all, you can make GAPS safe sandwiches with these waffles! What a great departure from squash and soups, yes? To learn more about the GAPS diet and it's healing abilities for myriads of symptoms including poor digestion, click here. For even more resources, here. Waffles shouldn't be limited to savory sandwiches and can easily be incorporated into a dessert dish for something sweet. 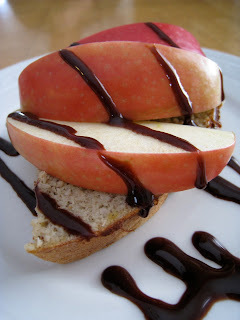 This is a waffle sliced in half topped with organic pink lady apple slices and organic chocolate sauce. What a treat! Don't let the pretty pictures fool you, they really are easy to make! Simply take a waffle quarter (I have a Belgian waffle iron that creates a round waffle divided into four pieces), gently cut it in half, and fill with the ingredients of your choosing. Freshly sliced cheeses, meats like bacon, roast beef slices, roasted chicken and turkey, as well as homemade meatballs add protein. Veggies like cucumbers, tomatoes, and lettuce add some filling crunch. Spread the insides with goat cheese, grass-fed butter, homemade mayonnaise, real guacamole, or nut butter and jam of choice. Avocado slices and fried eggs would be a yummy option as well. Feel free to create the sandwich of your dreams! i wonder if i could nix the bananas in the waffle recipe for a turkey sandwich? i'm craving turkey sandwich. with mustard. and cheese. and avocado. and cucumber. i think these are just normal pregnant lady cravings. ok, i'm making this for lunch tomorrow. You won't taste the banana, ie, it won't compete with your savory turkey at all. So don't fear to use the banana! I simply NEED a waffle maker just to make sandwiches as cute as these. I've been seeing some good grain free recipes around. Just tried your original waffle recipe yesterday at breakfast; two triangles topped with over-easy eggs = amazingness. Today's lunch was a waffle melt with homemade tuna salad (canned tuna, homemade garlic aioli, chopped cukes, onions, pickles, parsley and dill), cheddar and tomato. Wow. Seriously delicious and SUPER filling. I completed a Whole30 in March, and since then have been trying--sometimes not so successfully--to follow a gluten-free/paleo diet. Recipes like this make it so much easier to do so. Thank you!